Archaeologist Dr. Eilat Mazar is recognized the world over for her incredible finds in Jerusalem that verify the biblical record. She has a rich history with Herbert W. Armstrong College and theTrumpet.com. The college first dispatched students to Jerusalem to support Eilat in 2006. Since then, dozens of Armstrong students have volunteered on Dr. Mazar’s excavations in both the City of David and the Ophel. Dr. Mazar is currently leading another excavation on the Ophel. As is now custom, Eilat is supported by Armstrong students and alumni: 11, to be exact. 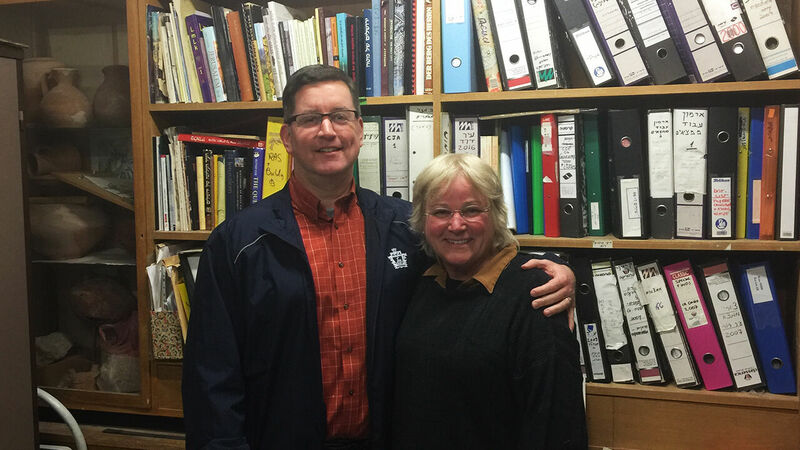 I visited Dr. Mazar and the students in Jerusalem last weekend. During the visit, we broke out the microphone and I sat down with Dr. Mazar to discuss the Ophel dig, as well as some of our fondest memories from the past 50 years. You’re starting your third phase on the Ophel? Actually, [we are completing] the second phase—we’re still waiting [to start] the third phase. Which hopefully will be very soon; [in the third phase we will be] excavating the very eastern end of the Ophel. You started two weeks ago. You’ve spent a few days clearing things out, getting ready to dig—you had a couple of rainy days last week. But now you are off and running. Yes, yes. We did spend some time cleaning and preparing access, safe access; we are in the middle of the winter, so we need to be extra careful as to how people walk, safe walking. But now we are really reaching, as you said, reaching the archaeological strata [where] we can really do pure, you know, clean archaeology, and start going down and learn [about] the history of Jerusalem. This dig is a little smaller and shorter than the two previous phases; tell us why that is. Well it’s shorter and very focused [because of the two] relatively small areas. [We are] completing what we have already done. In 2013, we [only] started excavating in the cave. [We did not finish], but we did do some testing in order to know what we can expect to excavate, and that’s what we are doing now. [We are] excavating the full content of the cave, which contains interesting history. But we are going to dig and really learn exactly what it is. [This cave is] a special phenomenon in the history of Jerusalem. Volunteers from Armstrong College pose for a photo near the site of the 2018 Ophel excavation. Then we are going to enlarge the excavations and get to know more about the medallion house. [This is where] in 2013 we discovered the treasure of the gold and silver jewelry, including the medallion, with the Jewish symbols, the seven-candles menorah, and the shofar, and the scroll. Now we want to learn more about the nature of the building [in which] these people were hiding their treasure. [We also] have a very interesting and quite complete first-floor building from the Byzantine period. We would like to know whether or not it’s a regular house they were entering, whether we can really see some clues as to why they were choosing this specific building. [This house] is in the middle of the Ophel site, so it’s important by itself to get to know this building. So these are the two major goals in front of us. The medallion house would be in Area Supervisor Amir’s area? The dig is divided into two areas. How long has Amir been digging with you? Wow, Amir has been digging with me since 2005! And then our very own Chris Eames is supervising the excavation underway in the cave? Well, this is a very nice story. 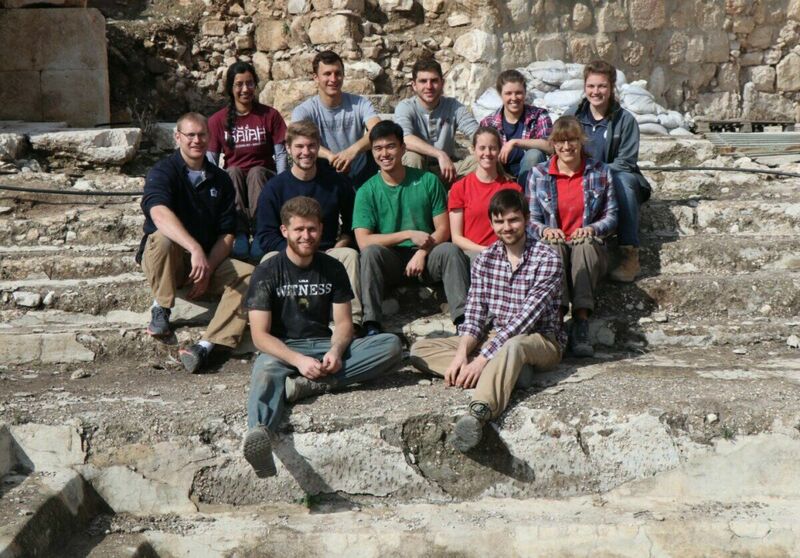 Brent and the students from the college started working with us in the City of David [in 2006]. At the beginning they were, you know, just volunteers. [But] then they got to know the systems of registration and everything we do. [Eventually] Brent became an area supervisor assistant—and he did great. So he became later a supervisor by himself, excavating the most important area of our excavations in the City of David. Then when we turned and moved to the area of the Ophel, Brent again acted as an area supervisor, and Chris assisted him as an area supervisor assistant. Now, Chris is an area supervisor in the cave, so this is kind of tutoring the student generation after generation and this is beautiful. Yes, that’s one thing that is amazing about you because you know about our college, but you know obviously it’s not an archaeology school by any means—and I know in Israel they do place a lot of importance on the credentials. So for you to put that much faith in people who are really pretty inexperienced, but just have a real eager desire to learn, it really does give them a great opportunity not only to dig but to take on responsibility as well. Well, you more or less said it all, because if you have such a great desire to learn, this is the best of so many things; it’s not just the degrees in university that count. Of course it does count—it’s not like I do not consider that important—but if you are so devoted, so eager to learn, so open-minded, learn on your own, and keep on doing it—this is all very hard work, it doesn’t come easy. Nothing comes easy probably in life. So when all that’s together, [it] counts for so much and it counts everything to me. So, that’s the way it goes. Well, speaking of the experience they’ve picked up along the way. Brent and I were talking about how far back we’ve gone, starting in 2006. I believe if you count the repairs you did on the Nehemiah wall, I think we’ve had volunteers here for seven different excavations. So we are starting to get a little history. We are not an archaeology school, but you put all those excavations together and you’ve seen quite a few of our students over the years. Yes, and I do believe that we cannot disconnect it with the previous participation of the Ambassador College at my grandfather’s excavations! It means we’re getting old! What is—50 years is it? 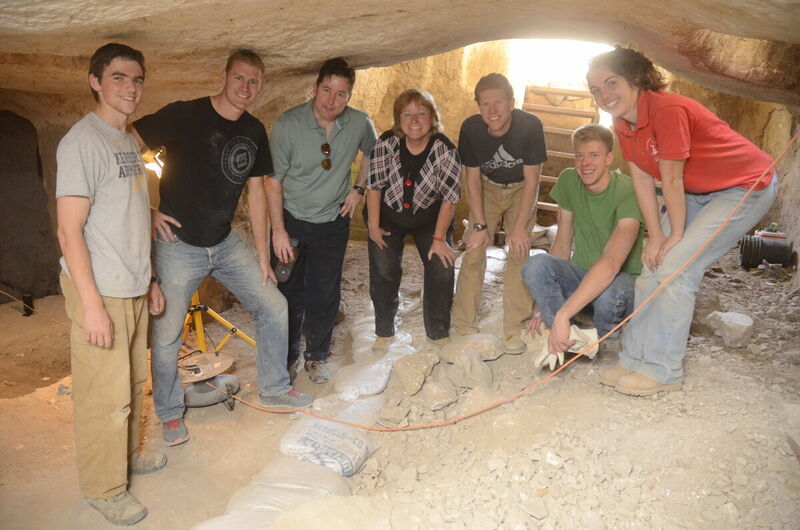 Stephen Flurry and Armstrong College volunteers from the 2013 Ophel excavation pose for a photo with Dr. Eilat Mazar inside the cave of Area B (now Area M). Fifty years of partnership! I mean, this is unheard of! And when Mr. Armstrong at the time created such a beautiful partnership with my grandfather, supporting with such a degree, unbelievably high degree of participation and support at the Temple Mount excavations at the time—bringing dozens of students each time and supporting the excavations, the excavations all the yearlong. So this is a continuation. And then part of it continued in Yigal Shiloh’s excavations at the City of David, which I was only a member of Yigal Shiloh’s team. So it was quite natural, I believe, to see that one day you came along and showed interest. So it was like, yeah, how come you didn’t come before? But we didn’t have excavations at that extent. So I believe that once you heard that we are having excavations in the City of David, then a year after you were there. Right, as soon as we saw “palace of King David” in the news. I mean, I think you’ve done a better job of connecting all the dots to Benjamin Mazar and the Ambassadors, because honestly I do remember when we first saw the article or the news release that you had found the palace of David. Then we thought, Well we need to get in contact with her. Do you remember, I think it was e-mail that started it off, and then was it Andrew Locher and me who came over here? That first time just to meet you and see if we could send some students. I know we sent three students on the first excavation. Jeremy, right. And then we also thought that it’s great, and the results are wonderful. Then more students came, and more students got important positions and made contributions to a specific dig. It’s now almost sure [that] we are revealing King David’s palace, revealing part of it. 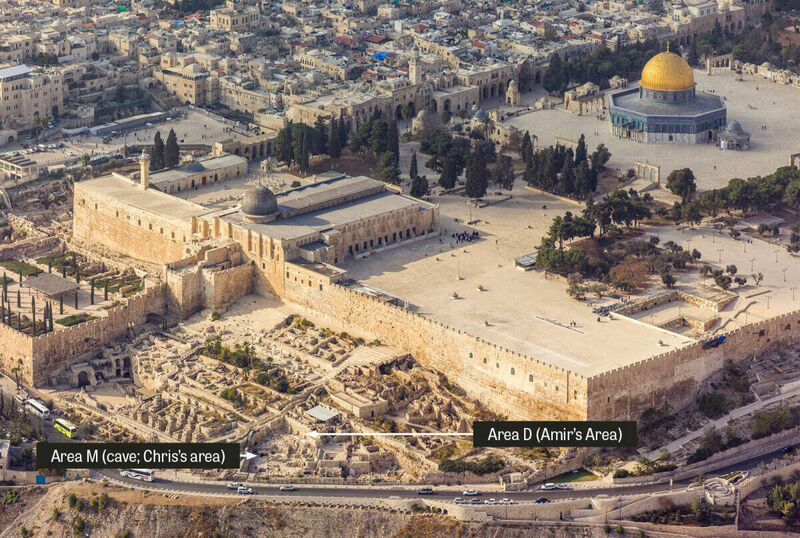 But [we are] also excavating the area that is outside the Nehemiah’s wall and what’s underneath, supporting greatly the existence of King David’s palace because it’s leaning against it. And also the tunnel behind, which almost only the students of the college participated in. So the contribution all together of the students is extremely high. That’s for sure. As far as the Ophel—that started in, I think 2009, when Harley and Brent came over here. True, this was the new excavations. [At first we believed] we were going to do a small work completing, you know, specific spots that needed to be completed. But then we discovered very much that is significant. So when Harley and Brent were excavating in Area A in 2009, and this area, eventually as we see now, revealed Hezekiah’s seal impression and many other important discoveries and finds. So when Harley and Brent were excavating in Area A in 2009, and this area, eventually as we see now, revealed Hezekiah’s seal impression and many other important discoveries and finds. So, this current one that you’re on ends about the end of March you said the other night? … Be about a three-month dig? Yes. Oh, now? Yes, yes, yes. It’s a short season relatively. And then you have anticipated one more substantial dig on the Ophel and you estimate that would be about a six-month dig maybe? At least. OK, the third phase, the full third phase: [This is at] the very end, the eastern end of the Ophel, where we expect to reveal King Solomon’s part of his own palace complex. [In this] area, we believe, there is a great deal of probability that the preservation there is very well [in excellent condition]. This means [walls] meters high with preservation of the construction of that period … of that King Solomon’s. The expectations are very high. We will need to wet sift a lot, to get many more bullae, which we will, I’m sure. So this is going to last quite some time because the scale of the excavation would need to be very careful and invest a lot in sifting and being more detailed about it. So this going to last at least half a year—at least. It’s impossible to predict when that will start, but when do you hope? If it were up to me, you know, tomorrow. But it’s not, and even four years ago, many obstacles on the way which I like to believe that most of them are solved—many bureaucratic and obstacles which are not in our hands. Bureaucratic, mainly. I do hope that will be solved and that we will be able to go. I do not dare really to say let’s hope with two months, three months, half a year. I learned that this is just, you know, a kind of wasting time trying to predict that, but I do hope, and it seems right, that it will be very soon. If we have 11 volunteers on this mini-phase, maybe next phase we’ll send 20. You can send as many as you like. They’re always more than welcome, and we have plenty more room because that area will need many volunteers. [A]nd volunteers from Ambassador College are always welcome. It’s nothing to compare with, I can tell you that. Dr. Eliat Mazar, thank you for being with us today.